To insert a tool means to loosen the collet nut halfway and insert a tool with a 1/8" shank into the collet about ¾". Then use the wrenches to tighten the collet nut until snug. To locate a tool means to go through the automated process of measuring the vertical distance between the tool tip and the collet, so that the machine knows where the tip of the tool is in space. Since inserting a tool is part of the tool-locating process inBantam Tools™ Desktop Milling Machine Software, we’ll start with locating a tool. If you just need to know how to insert a tool, feel free to skip ahead. Why is tool locating important? Once it is homed, the Bantam Tools™ Desktop PCB Milling Machine knows the position of all its built-in parts. It knows the bed position in the x and y dimensions, and it knows the distance between the end of the collet and the bed. However, our software still needs your help in finding the tip of the tool. Some tools are longer than others, and tools can be inserted into the collet at different depths. Each time a new tool is inserted into the milling machine, our software must measure how far the tool tip extends below the collet. Skipping this step can result in plans being cut in the air above the surface of the material, or worse, down into the machine bed! You should go through the tool-locating process every time you adjust or change the tool. How does tool locating work? Our software locates tools by automatic touch-off, which means that the tool is lowered until an electrical connection is made with the bed. Nonconductive or extremely long tools cannot be located automatically, so make sure your tool is conductive (HSS and carbide tools are; others may not be) and is two inches long or less. Start the process. 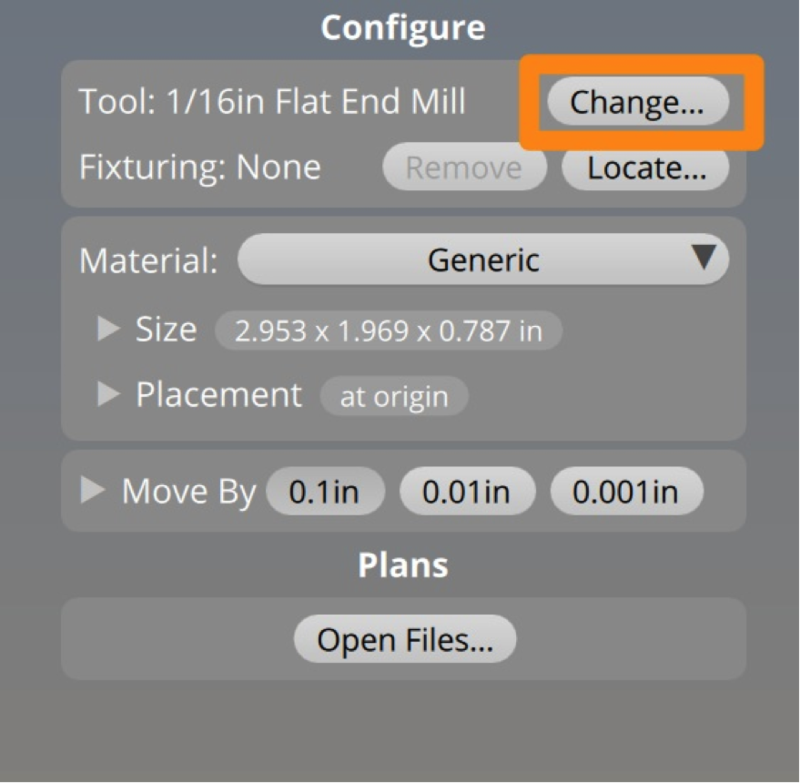 In the Setup panel on the right side of the software, click the Change button. Remove the old tool, if there was one installed. To do this, use the collet wrenches to hold the spindle in place while loosening the collet nut. You’ll notice two clicks before the tool is released. 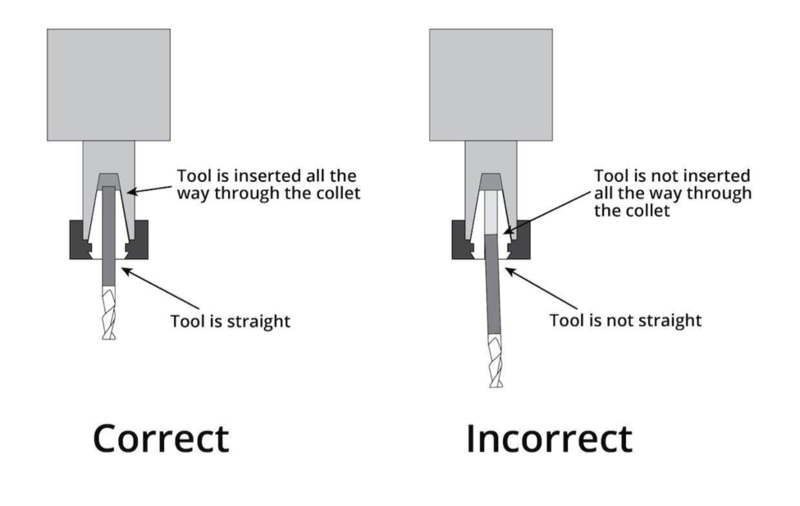 If possible, use a finger to hold on to the tool while loosening so that it does not fall from the collet. Make sure the tool is inserted all the way through the collet, as shown (about ¾"), and tighten with the wrenches until snug (don’t over tighten). Choose your tool from the drop-down menu. If you’re in the middle of a cut operation that requires a certain tool, the software will select it for you. Verify the tool position. The software will try to move the tool in the x and y dimensions so that it’s over a clear spot on the bed. Confirm that there are no stray pieces of material, tape, or glue underneath it. 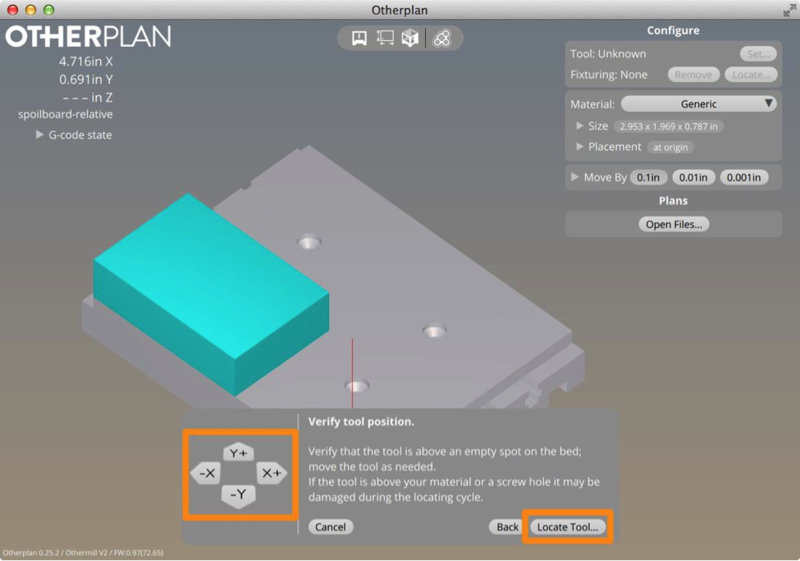 If there are, adjust the tool’s position with the buttons in Otherplan or clear the debris from the bed under the tool. Click Locate Tool and watch as the software automatically locates the tool. You’re done! The software has located the tip of the tool in space. Once you’ve attached your material to the bed, set your material dimensions, and loaded a plan into the software, you can begin milling.